Are we literally jumping into a freezing cold lake just for the health of it? Absolutely! 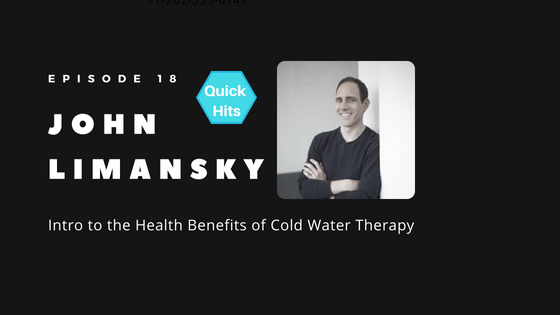 Join Dave and Dr. John Limansky for this Quick Hits episode about the benefits of cold water therapy and how it can benefit you in reducing stress while costing you nothing. Be sure to watch the video! Welcome to the latest Quick Hits feature episode, delivering the quick and dirty details on topics that are important to you and your health. In 15 minutes or less, we’ll deliver important health info to you to keep your mind active whether you’re waiting in the carpool lane, on your morning commute, or fitting in a quick workout! When was the last time you jumped into a cold lake, just for the fun of it? In this Quick Hits episode, Dave Korsunsky talks with John Limansky, MD, board-certified physician of Internal Medicine to discuss the stress-reducing, immune modulating, and therapeutic benefits of cold water immersion therapy. We’re diving in quick to get you the big ideas and then we’ll provide you with some resources at the bottom of the page for further reading if you want to learn more. This podcast is brought to you by Heads Up Health, a web app designed to help you centrally track all of your vital health data. Instantly synchronize your medical records, connect your favorite health devices like the Oura ring as well as other devices and apps and use your data to optimize your health! Check out this video where Dave and John take a dip into the balmy waters of Lake Tahoe at 42 degrees!